Beginning with the history of the field of pharmacy work and pharmacology, the course will emphasize appropriate medical terminology, anatomy and physiology, math as related to filling prescriptions, and drugs as related to body systems. How to accept prescriptions for filling, gather and process necessary information, calculate anticipated drug dosages, and compound, package, and label pharmaceutical products under the direction of the pharmacist will be covered. Students will learn operations of pharmaceutical machinery and how to maintain and clean equipment, work areas and shelves. 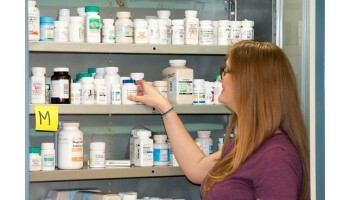 Students will acquire the skills to perform clerical tasks, prepare prescription labels, process pharmacy medical insurance claims and learn to receive, store, and inventory pharmaceutical supplies. Be at least 17 1/2 years old on the first day of class. â€¢ High School prerequisites: be a high school senior; complete Intro to Pharmacy Technician with a Certificate of Competency. High school students must have a or better in Math and Science. If an adult, must provide proof a HIGH SCHOOL DIPLOMA or GED. (Translated into English). Our pharmacy program partners with PioneerRx, the top pharmacy management system in the industry. PioneerRx enhances our curriculum with a hands-on approach to learning that simulates the functions and workflow of today’s most innovative pharmacies. For more information, visit www.pioneerrx.com. See how PioneerRx compares to other pharmacy software vendors at www.pharmacysoftwarereviews.com. Jennifer F. has successfully found employment as a Tutor/Instructional Assistant after completing course(s) in Developmental Psychology of Children.